Protect your car, truck or SUV interior while adding style and fashion. Our new Baby and Child Seat Car Protection Mat is such a wonderful product. It truly is amazing. Protect your car from all the spills and mess with these easy to clean and attractive answer to protecting your car, truck or SUV seats. Easy to use and your car seat mat can be personalized with choices for carpet color, border, embroidery font and color. Add your child's name (up to 15 characters allowed). 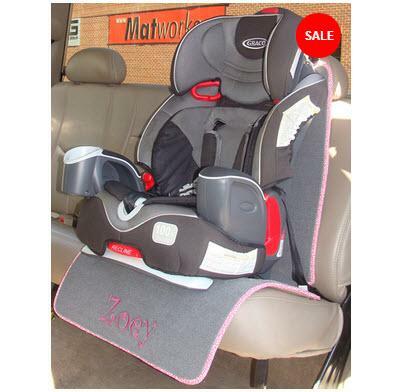 A personalized custom child seat car mats instantly adds style points into your ride! Our custom monogrammed car mats are available in hundreds of styles to enhance your interior while protecting your automobile's carpeting. We cater all personalities from trendy and stylish to a more sophisticated look, no matter what your styling preference we have it and you customize it! Quality that has been tested, tried, and true for over 17 years. Price: $150.00 In stock! - Browse this brand: MatworksOur products are custom made to your specifications. This product ships up to 3 weeks after your order is placed.